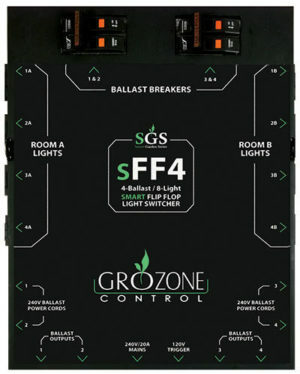 Grozone SFF4 : SMART FLIP FLOP LIGHT SWITCHER is designed to operate high intensity discharge (HID) lighting systems. 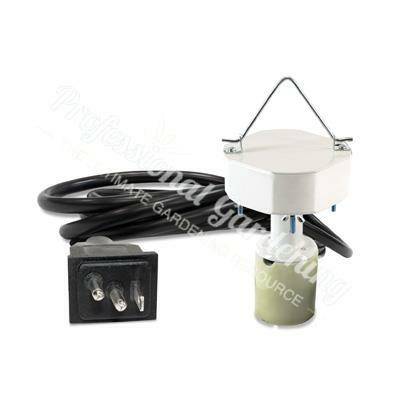 The switcher can handle up to eight (8) 1000W HID metal halide (MH) or high pressure sodium (HPS) grow lights. 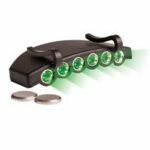 Designed to operate 8 lights in 2 different rooms, from 4 common ballasts. The Room A lights and Room B lights are never lit simultaneously. 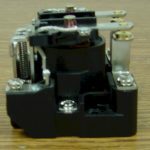 For both rooms, the activation of the internal power switches (relays) is performed through a common 120V trigger cord. 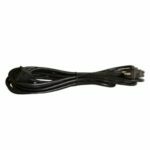 This light switcher provides up to 20A of capacity on a standard 240V circuit. 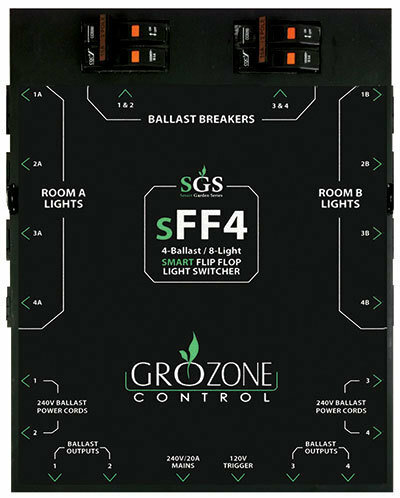 Grozone SFF4 : SMART FLIP FLOP LIGHT SWITCHER is built with only the highest quality components and will provide you with years of trouble free performance.